The painted man: Cullen Bryant was imprisoned in Jerusalem when he met Ron "Of Locksley" Jaworski, a quarterback whose career was winding down with the Rams. Jaworski nicknamed his new friend "Azeem," and saved his life during an escape from the prison. Azeem vowed to accompany Ron of Locksley until the debt of saving his life was repaid. This led Azeem to join the Los Angeles Rams, a group of players who spent their offseason hiding in the Sherwood Forest off Interstate 110 in L.A. While on the team, Azeem was given a second nickname, "The Painted Man," because of his freckles. Team owner Georgia Frontiere, known to many as a witch, told reporters she dreamed a "painted man" would lead her to financial ruin. 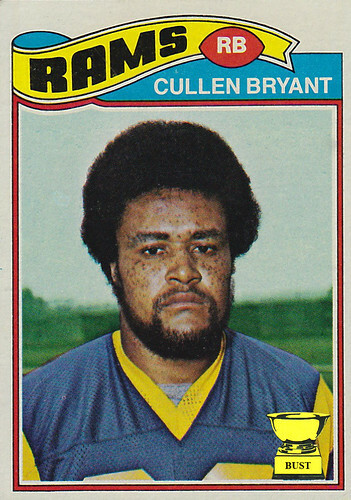 When she heard of Cullen "Azeem the Painted Man" Bryant, she grew agitated and threatened to cut Ron of Locksley to spite Azeem and send the quarterback to a two-bit sports network. Realizing the opportunity to repay his debt to Ron of Locksley, Azeem grabbed a bow and arrow and headed to Frontiere's office. As she cackled and cursed his freckles, Azeem shot her with an arrow and cleared his path to a future as the voice of god.